Before MST3K there was The Texas 27 Film Vault, hosted by Randy Clower and Richard Malmos. Balladeer’s Blog’s examination of this neglected 1980’s cult show continues. Here’s another review of an episode where an original broadcast date can be determined. EPISODE ORIGINALLY BROADCAST: Saturday May 25th, 1985 from 10:30pm to 1:00am. EXTRAS: With 2 1/2 hours to work with every episode our machine-gun toting “Film Vault Technicians First Class” Randy and Richard had plenty of time to show (and mock) episodes of old Republic serials before showing (and mocking) the night’s bad movie. 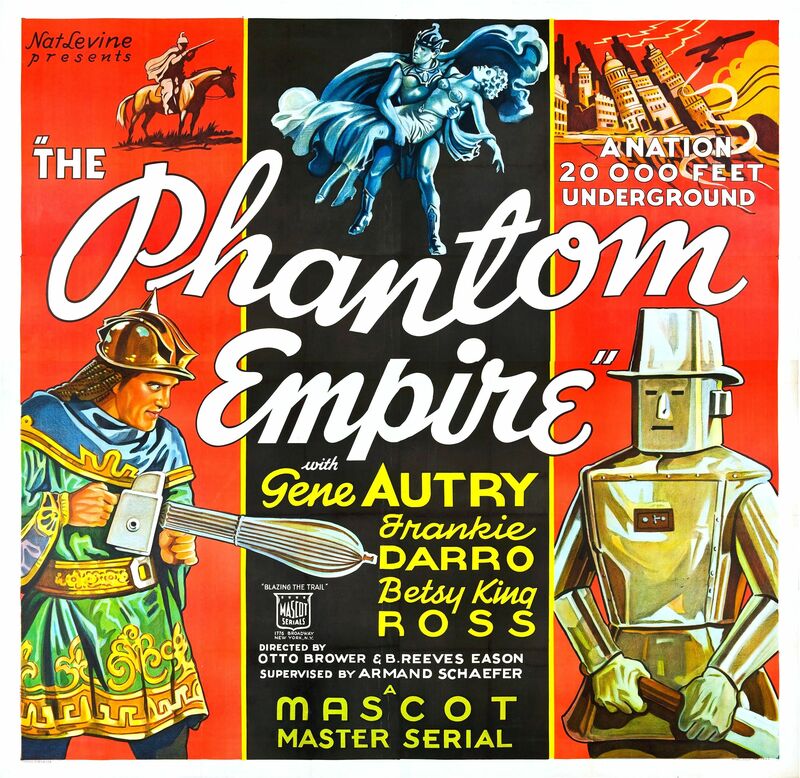 Before Horror of Party Beach our boys showed an episode of The Phantom Empire, in which Gene Autry played a singing cowboy who saves the world from an advanced underground civilization complete with killer robots. 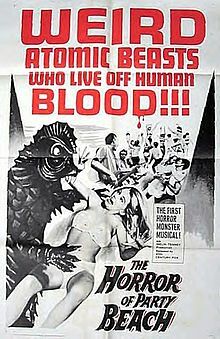 Yeah, most atomic beasts live off human brains! 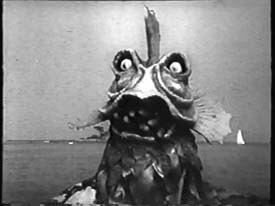 Also, a comedy sketch (which Randy Clower told me he still has footage of) from the episode featured Richard jamming a bunch of hot dogs in his mouth to resemble the absurd, multi-tongued sea creatures in Horror of Party Beach. FILM VAULT LORE: Special thanks to my fellow Texas 27 Film Vault fan Jana for the date of this episode and which serial preceded the movie. She did not remember which chapter of the serial Randy and Richard were on, but you can’t have everything! Keep those T27FV memories coming, my fellow Vaulties! THE MOVIE: Horror of Party Beach is one of those flicks that is on EVERYBODY’S Worst Films of All Time list and has been for several decades. In the 1980’s the Medved Brothers’ books on Golden Turkeys helped secure its reputation. Just about every Movie Host show has presented this film at some point. 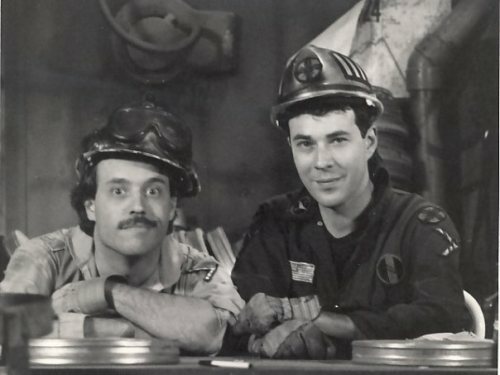 Randy (right) and Richard way down on Level 31 as they host their 1985-1987 show The Texas 27 Film Vault. even though that’s NOT what they are, are eventually destroyed with salt. That solution was recommended by Eulabelle, a black maid who plays the African American stereotype so broadly that even Mantan Moreland looks like Samuel L Jackson compared to her. The overall feel of this black and white cult classic is a sort of “Frankie and Annette Crossed With Frankenstein Meets The Space Monster” vibe. There are plenty of beach bums, a biker gang and lots of memorably odd rock songs provided by The Del-Aires. So much has been written about this quintessential example of “fun-bad” schlockers of the past for me to add anything new at this point. This movie always makes me laugh. You’re not alone on that! I like your reviews of bad movies but this show seems like a cheap MST3K imitation. Thanks, but this show came before MST3K. Texas 27 Film Vault started on February 9th, 1985 while Mystery Science Theater 3000 didn’t start until November of 1988. Mouthfull of hot dogs? Actually they look like vibrators. Ha! You certainly do have a point there.